Fifteen pioneers go into the Pioneer Obituary Index this month including two Presbyterian ministers and two female pioneers from Port Campbell. Also, two men who were in the transport business, a ship’s captain and a coach driver. And as with most months, there are those who lived a life of privilege and those for whom life was a struggle. Captain James Donaldson LIDDELL – Died 3 February 1878 at Queenscliff. James Liddell was born in Scotland in 1807 and arrived in Sydney around 1826. He came as Chief Officer of the brig Admiral Gifford and from there sailed on to New Zealand to trade with the Maoris. It was a successful voyage, so James went back to New Zealand on the ship Hannah. In 1830, James married Mary King in Sydney. In 1833, James arrived in Launceston as master of the Jolly Rambler. It was there he met the Henty brothers and was employed to captain their schooner Thistle on trading voyages to the Swan River, Western Australia. That took James close to the south-eastern coast of Victoria and on one occasion with Edward Henty on board, he sailed into what would later be called Portland Bay to collect oil from the whalers. They went ashore, saw William Dutton’s hut and potato patch then dug up a sod of the fertile soil to take back to Launceston to show Thomas Henty. (Bassett, Marnie The Hentys: an Australian colonial tapestry (Australian Paperbound edition, p. 252). Melbourne University Press, [Parkville], 1962). “LAND AT FIVE SHILLINGS AN ACRE!” The Argus (Melbourne, Vic. : 1848 – 1957) 20 May 1950: 4 (The Argus Week-end Magazine). Web. 21 Feb 2017 <http://nla.gov.au/nla.news-article22830263&gt;. By 1838, and aged just thirty-one, James took up whaling off the Victorian east coast. Five years later he was ready to return to New Zealand, a place close to him since his early trading voyages. Taking the family, James purchased land from the Maoris at Kawhia on the mid-west coast of the North Island. He turned to farming and boat building and began transporting supplies between ports in New Zealand. 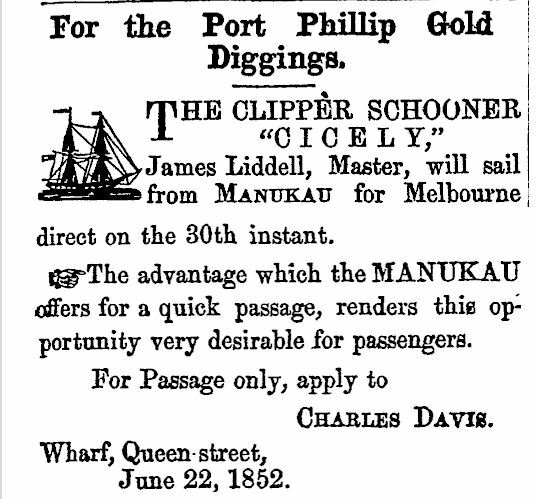 With the discovery of gold in Victoria, James started taking passengers from New Zealand to the diggings. 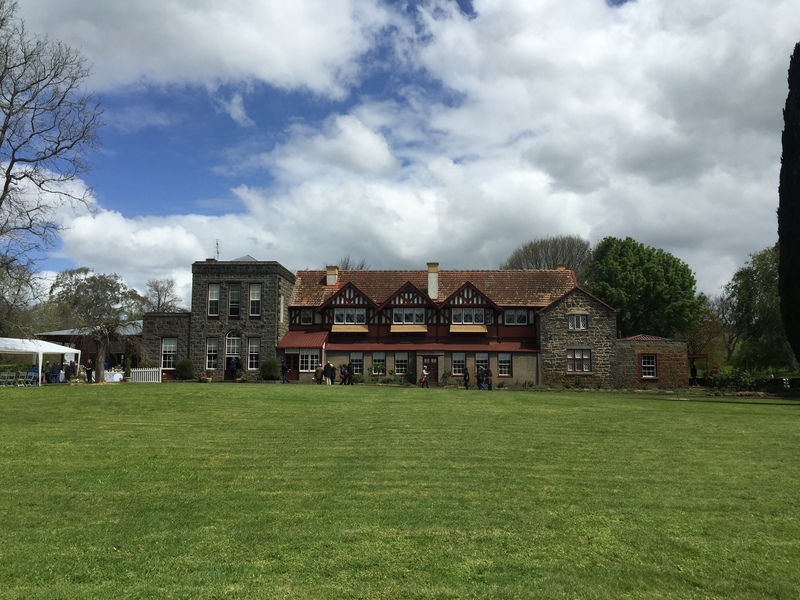 Soon after, the family home at Kawhia burnt down prompting the Liddells to leave New Zealand for Melbourne where James joined the Victorian Pilot Service. 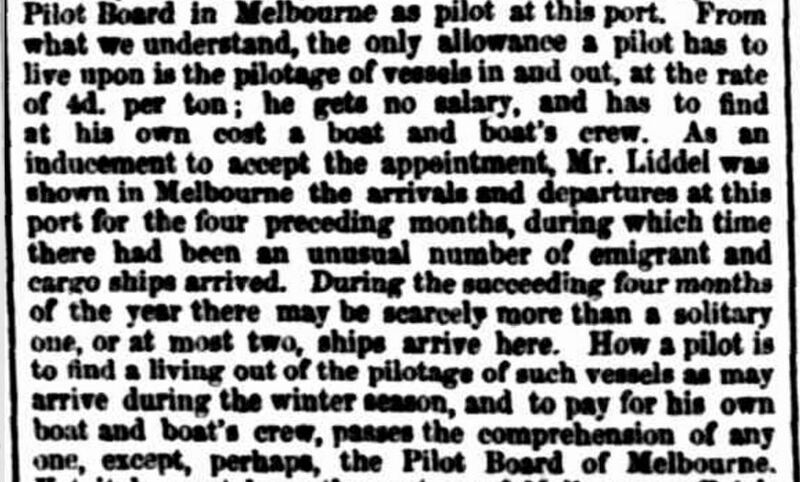 In early April 1855, James arrived in Portland as the appointed pilot for the harbour. There were concerns about he would survive off the little money a pilot could make. 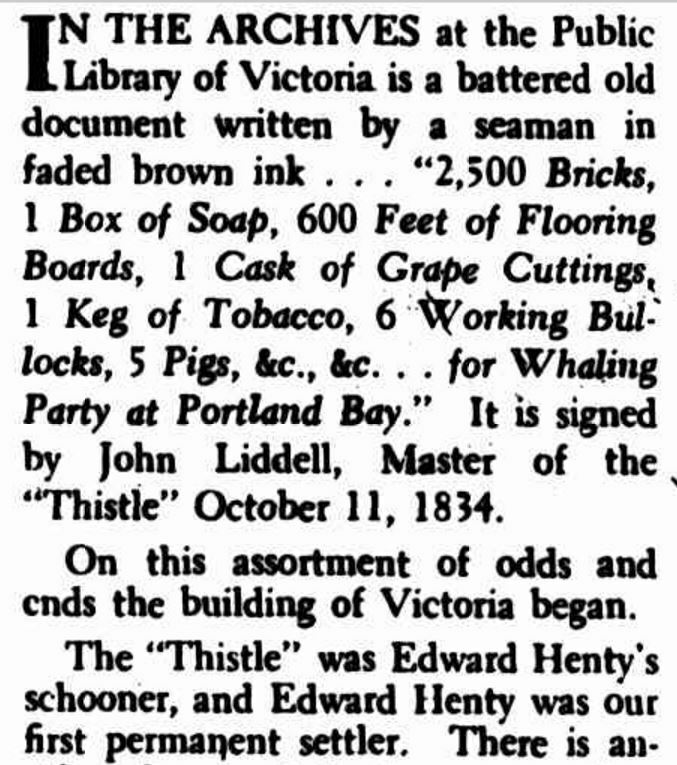 “PORTLAND.” South Australian Register (Adelaide, SA : 1839 – 1900) 11 April 1855: 3. Web. 24 Feb 2017 <http://nla.gov.au/nla.news-article49308755&gt;. The Liddells moved back towards Geelong and on 15 February 1859 James’ wife Mary died. The following year, he married Annie Justice. In his last years of work, James was master of the Geelong and West Channel lightships. He retired in 1870, living at Queenscliff. James had thirteen children, seven children from his first marriage and six children from his second marriage. At the time of his death, he had a two-year-old son and a great-grandchild. Life on the sea wasn’t lucrative and James and his family survived on his pension during his retirement. He had nothing to leave his family and some in the community were worried they would struggle if the pension was not continued for them. George HICKS – Died 13 February 1894 at Stawell. George Hicks was born in Cornwall around 1824. After leaving England, George went to South Africa for a few years before arriving in Australia during the 1850s. He got work with The Argus newspaper, eventually working as the commercial editor. He then worked as editor of the Geelong Advertiser and later the Ararat Advertiser. After a short time in Melbourne again, George went to Stawell and acted as that town’s correspondent for The Argus. In his later years, George’s irritability increased and he lost many of his old friends. In the end, he was living in a one-roomed cottage on the corner of Houston Street and Glenorchy Road, Stawell. His favourite quote was from Englishman Thomas Hood, “When he is forsaken, withered and shaken, what can an old man do but wither and die?” It was a sad, lonely death with George’s body discovered by the postman. An inquest found although it was clear he had fallen out of bed and hit his head, the primary reason for death was starvation. Jean ROBERTSON – Died 11 February 1895 at Geelong. Jean Robertson was born in Aberdeen, Scotland and arrived in Australia aboard the John Bull in 1840 with her parents. Her father Thomas Robertson took up Mount Mitchell Station near Ballarat. On board the John Bull, Jean had met William Skene and they went on to marry in 1843. Once married, William became a partner in Mount Mitchell and Jean and William lived there until 1850 when they moved to Strathkellar near Hamilton, residing at the property William named Skene. William was elected as representative for the Western Province in the Legislative Council of Victoria and remained in the role until 1876. On retirement, the Skenes moved to Bell Park, Geelong, but William died the following year. Skene was sold in 1881 to Jean’s brother John. 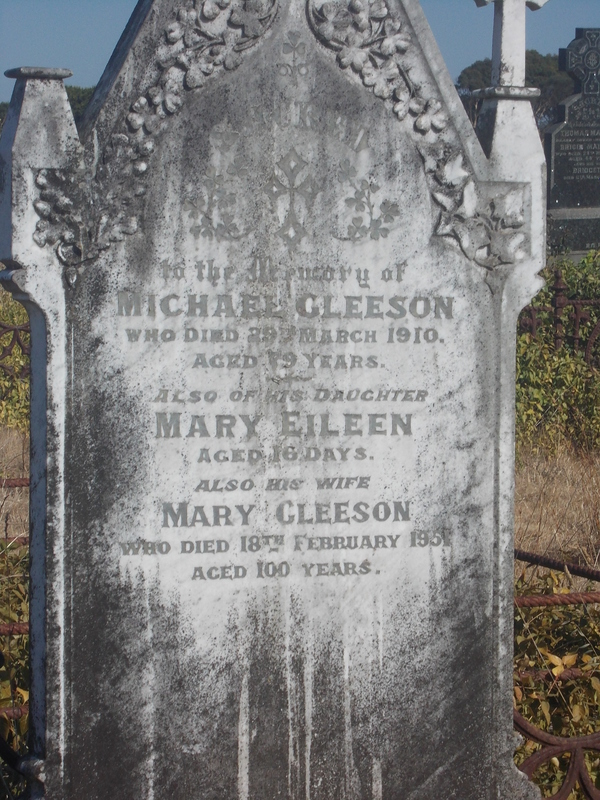 She remained in Geelong until her death. Jean was interred in the Skene family vault at the Old Hamilton Cemetery. Reverend John Kennedy MacMillan – Died 9 February 1904 at Hamilton. John MacMillan was born in Inverness, Scotland in 1832, a son of a clergyman. He went to high school in Edinburgh and then university at age thirteen, graduating when he was seventeen. 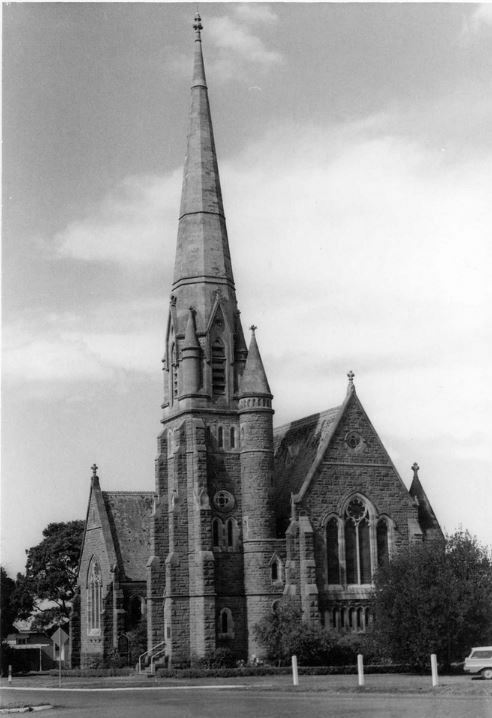 John began his clergy training in 1850 and was then an assistant at St George’s Church, Paisley, Scotland for around two years. With a demand for clergymen in Australia, John left Scotland in 1858, taking up an appointment at Beechworth. In the same year, he married Janet Manson Clarke. John was appointed to Hamilton’s Presbyterian Church (below) in 1869. During his time there, the church and manse were both expanded. While in Hamilton, John MacMillan sat on the committee of the Hamilton Hospital including time as President and was part of the development of Hamilton College and Alexandra Ladies’ College. He was also involved with the Hamilton Mechanics Institute. At the time of his death, John MacMillan left his widow, Janet and eight children. A lengthy report of John’s funeral is available on the link Hamilton Spectator 13 February 1904. 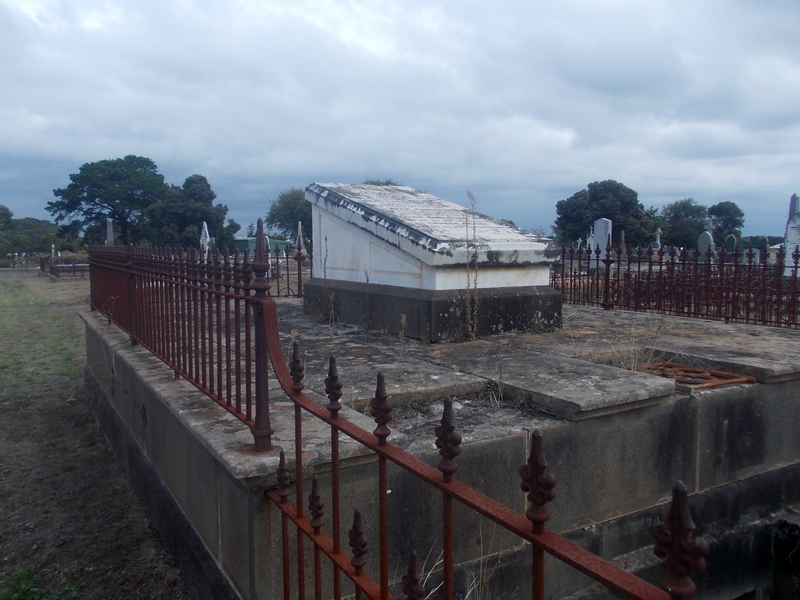 Reverend Samuel FRASER – Died 27 February 1914 at Terang. Samuel Fraser was born in Ross-shire Scotland around 1844 and attended the University of Aberdeen where he obtained a Master of Arts. He studied theology at New College, Edinburgh and was granted a license to preach in 1869. The following year Samuel arrived in Australia and Terang soon after that on a month’s trial. His first sermon was on 1 July 1870. A month turned into forty-four years in Terang for Samuel. In 1875, Samuel married Jane Hamilton, daughter of Reverend Hamilton of Mortlake and they had two sons and four daughters. In 1894, a new church opened, the Thompson Memorial Presbyterian Church (below). At the time of Samuel’s death, he was the only Presbyterian Minister in Victoria to have stayed in the one location for over forty years. James Robinson WOODS – Died 2 February 1915 at Portland. James Woods was born in Tasmania around 1849 and attended Horton College there. On arriving in Victoria, he worked for the Union Bank in Melbourne for some years. before joining merchants Grant & Co. of Port Fairy. From there, James went to Portland in 1877 to set up an outlet of Grant & Co. in Julia Street. He then started his own business as a shipping agent and auctioneer. In 1888, James married Margaret Robertson Cameron. He next went into partnership with Mr A. R. Balfour on the corner of Percy and Henty Street. James sat on the Portland Council for over thirty years and was Mayor several times. He played a large role in the resurrection of the Portland harbour and organising the Henty Jubilee. James also sat on the hospital board and was a member of the racing club. He left his widow Margaret, two sons and one daughter at the time of his death. John McCORMACK – Died 2 February 1916 at Hamilton. John McCormack was born in Limerick, Ireland around 1856. He was a builder and had arrived in the Hamilton district around 1907 having previously lived in Geelong. John first worked at Sleat Bank near Yulecart and then on the construction of the grandstand at Melville Oval, officially opened in 1910. John also worked on the construction of the Cavendish Railway Station. He was living at Cavendish at the time of his death but had stayed in Hamilton for two nights to finish a job. On Wednesday 2 February he called at the home of Mr W. Taggert in Thompson Street for lunch. He had only taken a few bites when he died at the dining table. John left three daughters who lived in Geelong at the time of his death. Catherine RYAN – Died 4 February 1916 at Port Fairy. Catherine was born in County Clare, Ireland around 1844. She married Thomas Maloney and they arrived in Port Fairy around 1865 on the Chariot of Fame, settling at Yambuk. Catherine and Thomas went on to have fourteen children but Thomas died in 1891 aged forty-eight. Catherine remained at Yambuk for a further twenty years before moving to Port Fairy to live with her son Dan Maloney in James Street. Mary CAMERON – Died 2 February 1929 at Camperdown. Mary Cameron was born around 1839 on the Isle of Bute, Scotland and arrived in Victoria in 1852, living at Modewarre, near Geelong, In 1884, with her husband Donald McRae and family, they moved to Port Campbell. When they arrived in Port Campbell it looked like the sketch below. Donald was active in town affairs and he and Mary attended the local Presbyterian Church. Donald died in 1913 and Mary went to live with various members of her family. She left eight children at the time of her death. Mary was buried at the Port Campbell Cemetery. Catherine Isabella McKEAN – Died 3 February 1941 at Newfield. Catherine was born around 1866 at Lucky Woman’s, a gold mining settlement south-west of Ballarat. As a child, her parents moved to Cobden then, when she was eight they moved to Port Campbell. 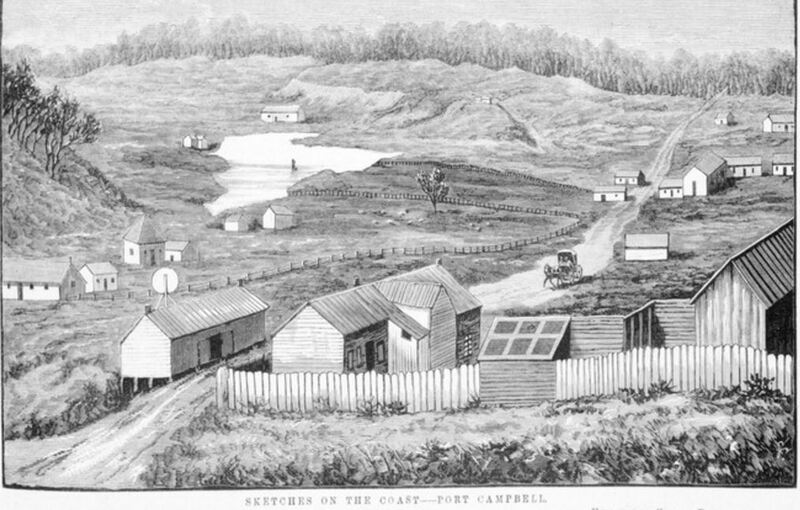 Like Mary Cameron (above), the Port Campbell Catherine grew up in was similar to the sketch above. In 1887, Catherine married Moreland Magilton. They lived at Cowley’s Creek briefly before returning to Port Campbell. Moreland died around 1938. At the time of her death, Catherine left five sons and five daughters, twenty-four grandchildren and one great-grandchild. Anne Josephine Selina LEMPRIERE – Died 12 February 1943 at Melbourne. Annie Lempriere was born around 1863 at St Kilda. In 1888, she married Cecil Trevor Cooke, formerly of Condah but then of Murndal, west of Hamilton. 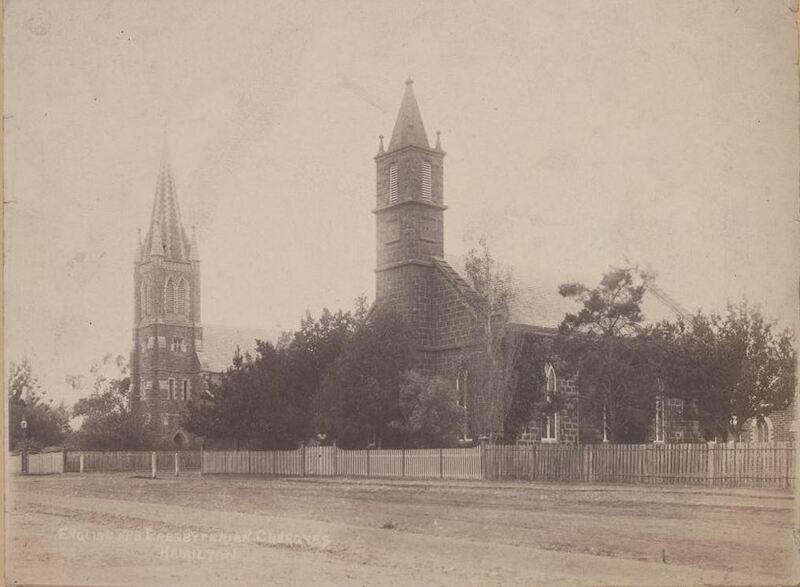 The wedding was held at St Mary’s Church Caulfield on 22 August 1888. From the time of their marriage until 1902, Anne and Cecil lived at Murndal as Cecil was managing the property. His brother Samuel Winter Cooke had inherited Murndal from their uncle Samuel Pratt Winter. 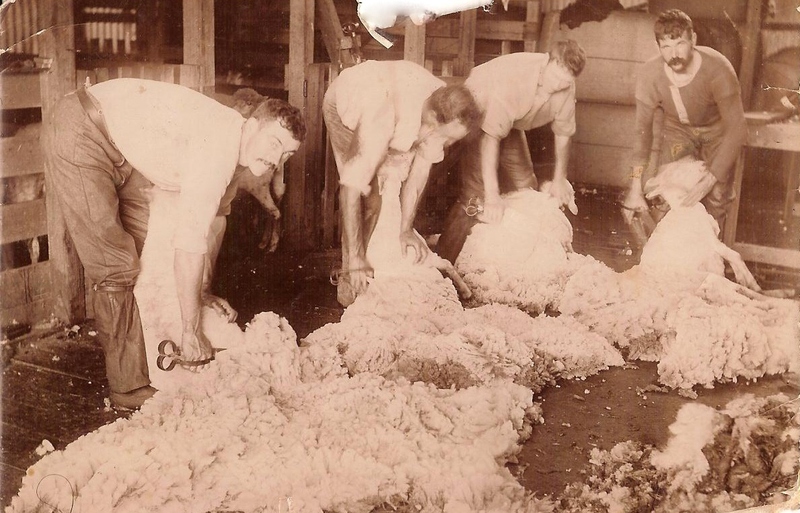 In 1902, the family moved to the Clondrisse Estate at Flinders then to Abshot Estate, Korumburra around 1917. Cecil died in 1922 at South Yarra. Anne left three sons, two daughters and nine grandchildren at the time of her death. She was buried at Murndal’s cemetery. 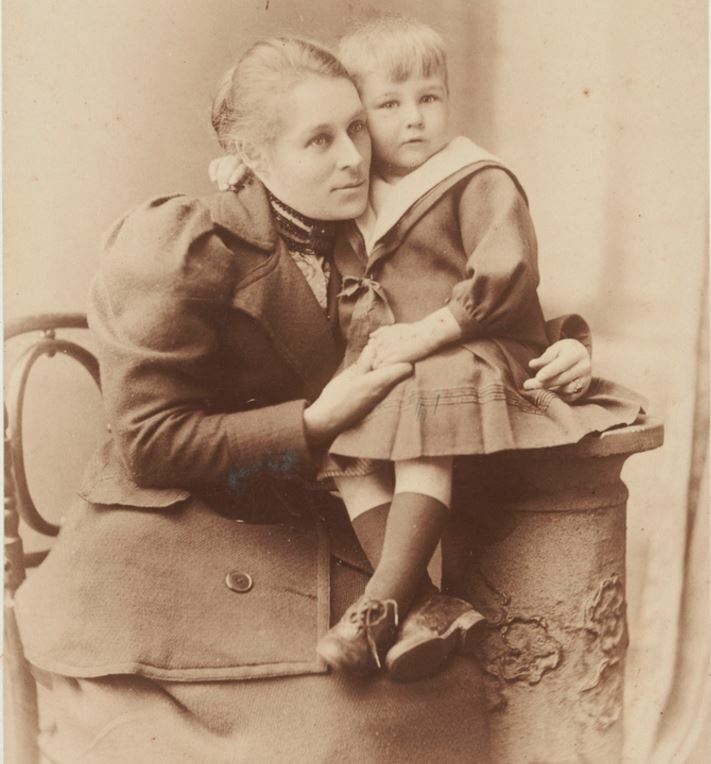 The photo below shows Annie and her son William Lempriere Winter Cooke. William was born in 1892 so this photo would be from around 1894. William served as a Captain with the 4th Battalion during WW1. While at Gallipoli, he collected acorns from a prickly oak growing on the island. He sent them home and the acorns were planted at Murndal and his former school, Geelong Grammar. More than one hundred years later the descendants of those trees are being planted across Victoria as part of the Gallipoli Oaks project. After the death of Samuel Winter Cooke in 1929, William inherited Murndal. Christopher HUMPHREYS – Died 13 February 1943 at Kew. Christopher Humphreys was born around 1863 at Koroit and married Maria Jane Johnston in 1884. He was the licensee of the Otway Hotel in Warrnambool during the 1890s, before taking over the Farmer’s Rest Hotel in Warrnambool in the late 1890s. 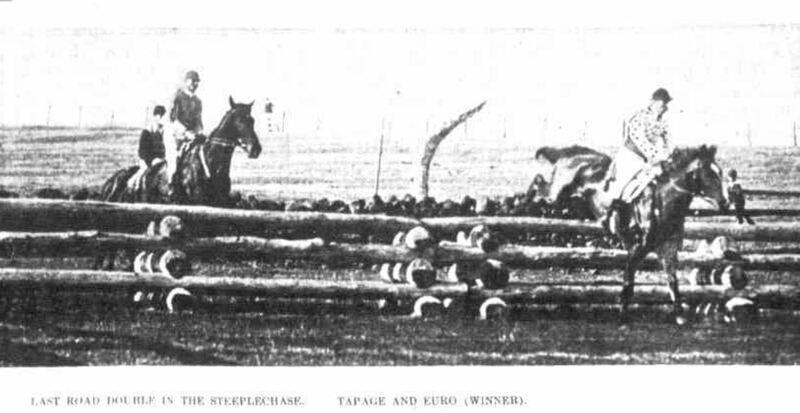 Christopher enjoyed horse racing and was the owner of the steeplechaser Euro, winner of the 1898 Grand Annual Steeple at Warrnambool and the Great Eastern Steeple at Oakbank. He also won the Bendigo Cup with Miss Gower in 1911. “WARRNAMBOOL RACE WEEK.” The Australasian (Melbourne, Vic. : 1864 – 1946) 7 May 1898: 25. Web. 23 Feb 2017 <http://nla.gov.au/nla.news-article138666284&gt;. Christopher retired from the Farmer’s Rest Hotel in 1928 and moved to Melbourne. Maria died on 23 December 1942 and Christopher died less than two months later. They had seven children but only a son and three daughters were living at the time of his death. Mary O’DONNELL – Died 18 February 1951 at Warrnambool. Mary was born in 1850 at Kilbane, County Clare, Ireland. She arrived in Victoria in 1870 with her parents and they settled at Yambuk. In 1884, Mary married Michael Ryan. They moved to Gippsland briefly then to Melbourne where they ran a green grocers at 27 Spencer Street, Melbourne. Their marriage was brief as Michael died in 1886. Mary then married Yambuk local Michael Gleeson in 1890 and she returned to Yambuk. Mary was buried at the Yambuk Cemetery. HEADSTONE OF MARY GLEESON (nee O’DONNELL) YAMBUK CEMETERY. Edward ADAMS – Died 23 February 1952 at Cobden. Edward Adams was born at Cobden around 1864. He first worked as a road contractor then took up dairy farming. In 1904, Edward married Elizabeth Richards and they had two sons. 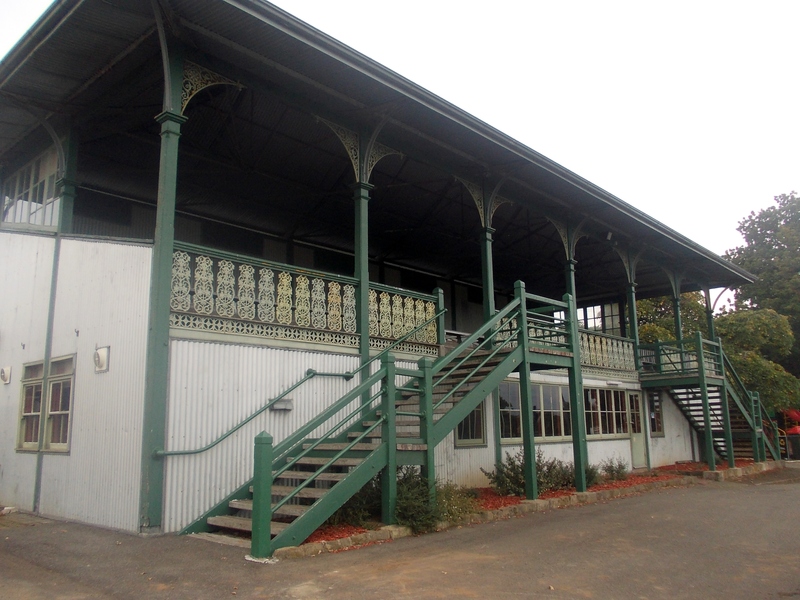 Edward was a member of the Cobden Turf Club, Cobden Football Club and the IOOF Lodge. William TARRANT – Died 6 February 1946 at Cobden. William Tarrant was born in a tent at Camperdown around 1856 and for twenty-nine years drove coaches for E.J.Morehouse & Sons of Cobden. He did runs from Camperdown to Princetown and Peterborough and mail runs on other routes. On weekends, he drove a four-horse drag to football matches. Another more grizzly task he undertook was transporting bodies from the coast to Camperdown or Cobden in the event of a fatal shipwreck. “Death of Mr. W. (Bill) Tarrant” Camperdown Chronicle (Vic. : 1877 – 1954) 15 February 1946: 3 (Afternoons.). Web. 23 Feb 2017 <http://nla.gov.au/nla.news-article65435134&gt;. In 1882, William married Mary Sarah Harding and they had three children. Mary died in 1929 and the following year William married Agnes Elliott of Cobden. After he retired from coach driving, William began a wood carting business. He enjoyed fishing and tending his garden in Curdie Street Cobden. He had a good sense of humour and quick wit and could tell a good yarn. 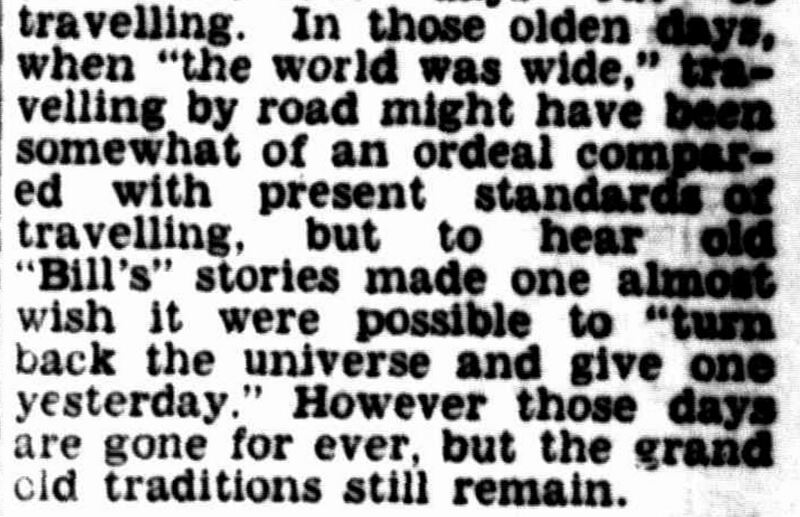 This entry was posted in Pioneer Obituaries and tagged Adams, Cameron, Fraser, Hicks, Humphreys, Lempriere, Liddell, MacMillan, McCormack, McKean, O'Donnell, Robertson, Ryan, Tarrant, Woods. Bookmark the permalink.